Year-to-date, the dollar index, a trade weighted index comparing the U.S. dollar to a basket of six major currencies, is up 2.95% as of April 29, 2013. What many are not aware is that this index has not really been updated since it was first created in the early 1970s, giving the euro a 57.6% exposure. 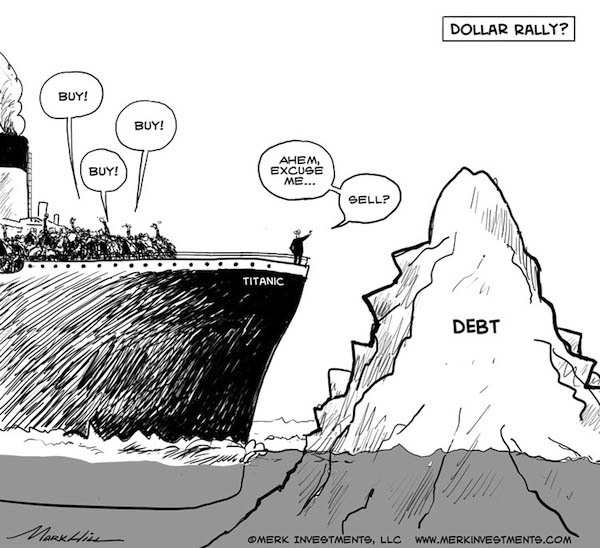 The dollar’s downward trend has been slowed in recent years in large part by the turmoil in the Eurozone. Additionally, the New Zealand dollar for example, which is not in the index, is up 3.37% year-to-date. Wherever there is a crisis, it is being “patched up”, suggesting that when the pendulum once again favors risky assets, more money might flow towards those assets; and when the pendulum swings once again in favor of the U.S. dollar, it may be less and less of a beneficiary. In other words, the safe haven status of the U.S. dollar may slowly be eroding. Assuming one believes interest rates are to head higher, it may be an expensive proposition to buy the U.S. dollar: as foreigners have historically had a major appetite for U.S. debt, their enthusiasm is historically trimmed back as the bond market turns into a bear market. As a result, early to mid phases of tightening by the Federal Reserve (Fed) have historically often been associated with a weaker dollar. It’s the late phases of a tightening cycle that the dollar historically tends to benefit, as the next bull market is anticipated for bonds. There may be little historic precedent for the environment we are in, but a rising rate environment, in our assessment, does not favor the U.S. dollar. 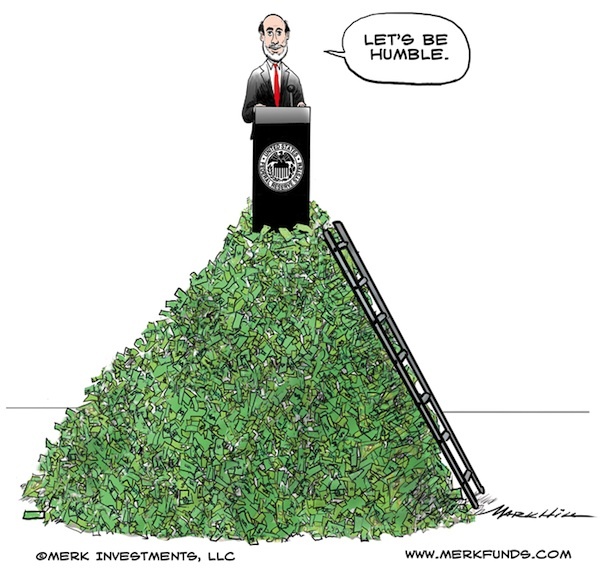 It was just about a year ago that Fed Chair Ben Bernanke pronounced in a press conference: Let’s be humble. He then clarified that meant that liquidity should not be mopped up too early; that we have to be sure that the recovery is firmly entrenched before one should consider an exit from the highly accommodative monetary policy. 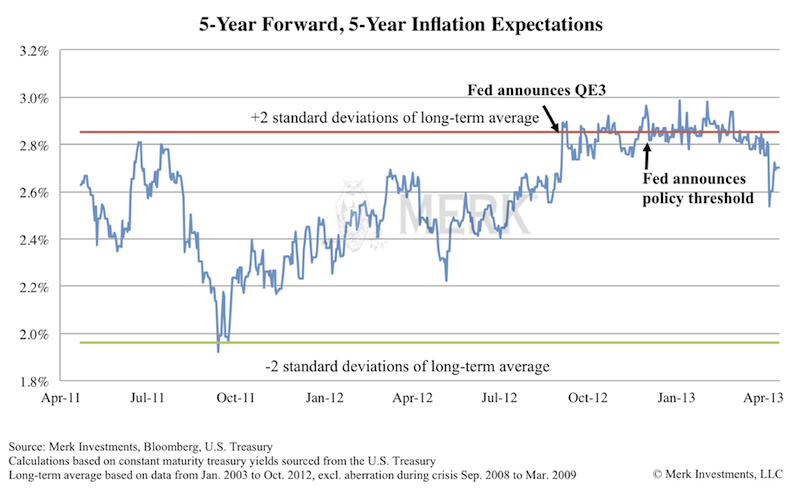 Bernanke has emphasized the Fed’s communication strategy and the importance of guiding market expectations. Without getting too technical about the chart, our assessment is that Bernanke is comfortable with inflation expectations at the upper range of this chart and may even consider more aggressive monetary easing when inflation expectations drop, as has occurred in recent weeks. A lowering of inflation expectations may suggest to the Fed that all the monetary action, all the “money printing” hasn’t been enough. Myth: economic growth will support the U.S. dollar. Technically, the Fed has pretty much ruled out selling the securities it has acquired. That’s because the Fed might have to sell them at a loss. The Fed has indicated it may increase the interest it pays on reserves to mop up liquidity when the time comes. Not only may that result in no longer paying over $80 billion in “profits” to the Treasury (the more securities the Fed buys by creating money with the stroke of a keyboard, the more interest it earns, the higher the Fed’s “profits”), but it will lead to tens, if not hundreds, of billions in direct payments to large banks. While there may be an academic justification to make such payments, the political fallout could lead Congress to suspend the Fed’s ability to pay interest on reserves, botching the exit strategy. Additionally, it’s likely that economic growth would drive interest rates higher across the yield curve. More important than the technical restrictions mentioned above may be the fact that the U.S. government cannot afford a high cost of borrowing to service the national debt. The average cost of servicing U.S. debt has come down from about 6% in 2001 to just over 2%. That cost of borrowing should continue to drift downward for a while as higher coupon Treasuries mature and are refinanced with lower coupon Treasuries. We are not predicting that the average cost of borrowing will zoom back up to 6% in the short-term, but what can come down, can also go back up. Even at 4%, discretionary spending by Congress will be crowded out by interest payments. Importantly, it may matter little what cost of borrowing the government can bear; more relevant may be the perception of the sustainability of U.S. government debt. Spain had very prudent debt management, with an average maturity of about 7 years for its debt outstanding; yet it took very little time for Spain’s government to be on the brink of a bailout. The U.S. bond market does not currently reflect serious concern about the sustainability of U.S. debt. However, without major entitlement reform, in particular in social security and Medicare, the numbers simply don’t add up. Many have argued that, over time, Congress will come to its senses and indeed engage in reform. We are actually quite optimistic ourselves: however, we believe that the only language politicians listen to is that of the bond market. The Eurozone is proof that policy makers choose between the cost of acting versus the cost of not acting. Whenever possible, politicians kick the can down the road. But unlike the Eurozone the U.S. has a current account deficit. That is, the U.S. dollar may be far more vulnerable to a bond market that’s imposing reform on policy makers than the Euro has ever been. The reason we put this discussion under the header of economic growth is that it may well be good economic data that help to unravel the perception that U.S. debt is sustainable as yields return to more historic levels. 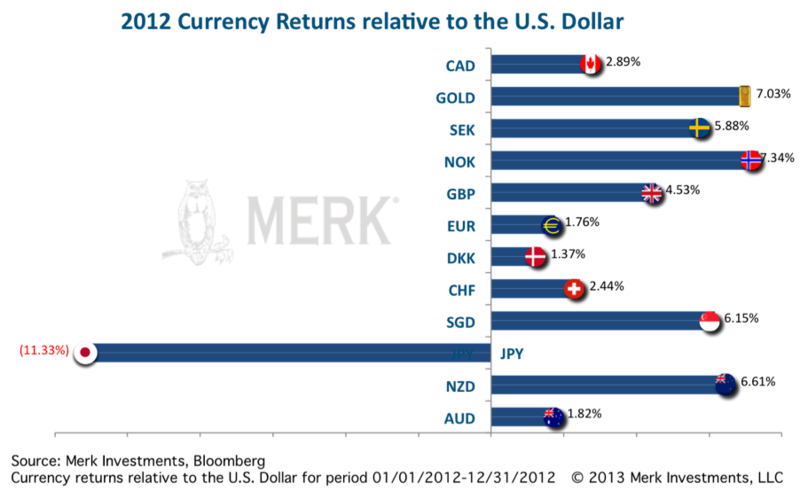 For a more detailed outlook on currencies, please read the Merk Gold and Currency Outlook. For purposes of this analysis, we want to show that it’s far from clear that the U.S. dollar will benefit in the environment to come. Indeed, the downside risks to the dollar might be as high as ever. Ultimately, there may be no such thing as a safe asset anymore and investors may want to take a diversified approach to something as mundane as cash. Please make sure you sign up for our newsletter to be the first to learn as we discuss global dynamics affecting the dollar. Please also register to join an upcoming Webinar; our next Webinar is on Thursday, May 23, expanding on the discussion herein.